Scouts, their parents and siblings all pitch in to harvest the troop's three-quarter-acre garden on the John and Cindy Roy potato farm in Fort Kent. A commercial broccoli plot along Route 1A in Fort Fairfield, August 2015. 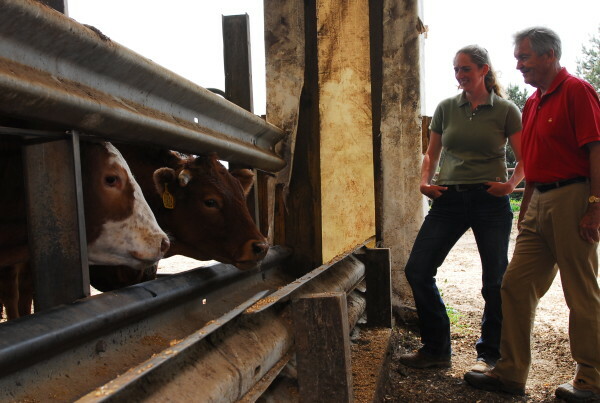 Christi White, feedlot manager, and Bill Haggett, CEO of Pineland Farms Natural Meats, look over the cattle being kept in the 400-by-80-foot building in June 8, 2011, in Fort Fairfield. Finally, after decades of young County men and women heading to the University of Maine’s largest campus in Orono to earn degrees in agriculture, UMPI now has its own ag offering, a new sustainable agriculture concentration that prepares students for a range of career tracks. “This is going to be the first chance for some real agriculture courses in The County,” said Johnston, an associate ecology professor and hops farmer, at a recent meeting of the Aroostook County Farm Bureau. A part of the environmental science degree, the concentration includes courses in animal, plant and soil science, pest management and human nutrition. Students can take advanced geographic information system classes or design their own research projects with the Cooperative Extension or local farmers. Next year, the program is hoping to use a grant to set up a greenhouse on campus. The concentration is geared toward northern Maine students interested in agriculture broadly, especially “students from farm families who want to stay around Presque Isle to work on the farm while taking classes,” Johnston said. It’s also aimed at supporting the region’s agriculture industry, to educate students who could work in both industrial farming and the kind of smaller scale, diversified growing that’s evolving around the state. UMPI’s ag concentration currently has four students, and Johnston said the university would like to see about 10 earning the minor each year. The program comes at a unique time for agriculture in Aroostook County and the state, as thousands of acres of land are underused and more young people want to farm, albeit on a smaller, diversified scale. Over the last 10 years, southern and central parts of Maine have seen a small boom in new small farms trying to serve demand for local fresh food, in everything from vegetables to dairy and pastured meat. Aroostook County, meanwhile, is home to a still-strong potato industry with some 55,000 acres in production, one of the East Coast’s largest broccoli harvests, a variety of grains, vegetable, apple and blueberry farms, and dairy and meat operations. Several new Amish families have settled into Aroostook County, growing for themselves and the public. Jon and Tristan Noyes, of GroMaine Farms, are plying the strategy of growing their vegetables — heirlooms like Flashy Troutback Lettuce — up north, just outside of Caribou, and selling to consumers and restaurants downstate, targeting the bustling, locavore-loving greater Portland market. And yet thousands of acres of farmland are lying fallow in Aroostook County. Just within the towns of Fort Fairfield, Easton, Caribou and Presque Isle, almost 19,000 acres of farmland are unused, according to a study by Johnston and UMPI geographer Chunzeng Wang. “They are not big 100-acre fields,” the kinds favored by large potato growers, “but many are still on well-drained soil with good characteristics,” Johnston said, noting that 85 percent are classified as important or prime land. “Taking all of that into account, I think there are a lot of new opportunities for ag,” Johnston said. “There’s land, there’s infrastructure, the land is cheaper than in southern Maine, where many new farms are developing. 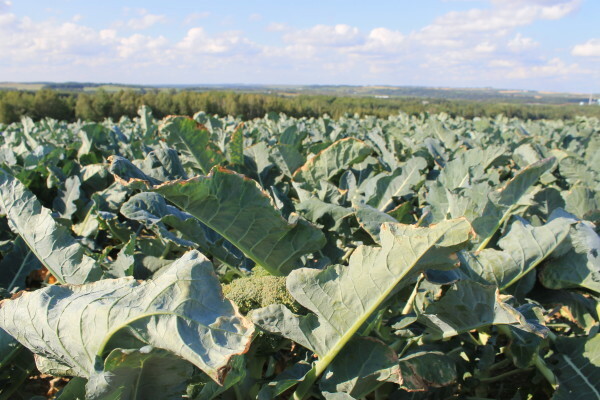 Climate change, for better or worse, is providing a longer growing season, with warmer Aprils and Mays and Septembers.” Different crops can be grown commercially in Aroostook County, or even livestock, “if we can find a way to process them,” Johnston said. 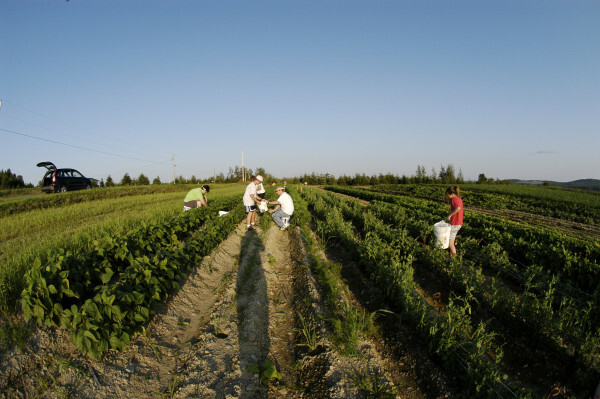 Across Maine’s 1.5 million acres of farmland, about 700,000 acres are currently regularly cultivated and some 400,000 acres could be changing ownership in the coming decade, according to the Maine Farmland Trust. While overdevelopment is not a major worry for northern Maine, it is a challenge to keep good farmland in production and to help new farmers get a fair chance, said Farmland Trust project manager Nina Young. “The best way to transfer your farm is to the next generation in the farm family. It doesn’t always happen that way,” Young said during the Aroostook Farm Bureau meeting. “There are a lot of new ideas about how farmers can access land — ground leases, long-term leases with options to own, different ways of purchasing it or having long-term renewable leases where they can build buildings and equity on,” she said. Among farms in ownership transition are five Aroostook County listings on Maine Farm Link. One, currently under lease for beef grazing, is a 100-acre ridgetop parcel in Perham with 45 acres of traditional crop and pasture fields plus 55 acres of woods. Priced at around $70,000, the land is good for apple trees, vegetables, potatoes and grains, beef, hogs and goats, or maple syrup harvesting, the listing states. Maine Farm Link also lists 14 applicants seeking land purchase or lease opportunities in Aroostook County, including young back-to-the-landers hoping to grow a dozen acres of organic veggies, experienced middle-aged farmers considering livestock grazing and larger investors seeking as many as 500 acres.